With Halloween right around the corner, we’re kicking it into high gear for the next few days with some frightfully fun features! 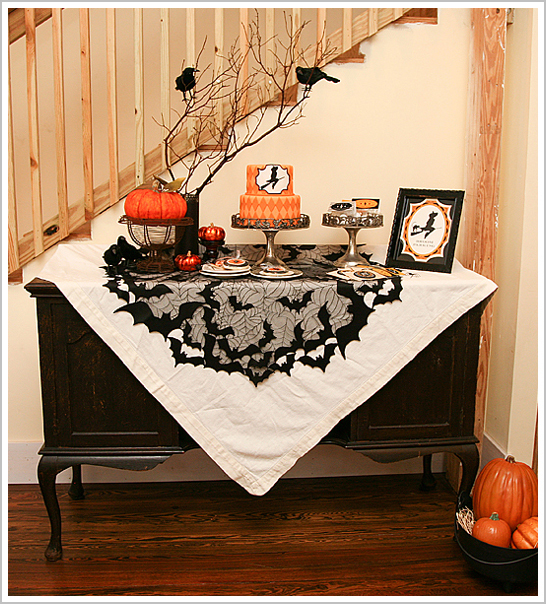 Starting today with a Bewitching Dessert Table, shared with us by Paula of Frog Prince Paperie. 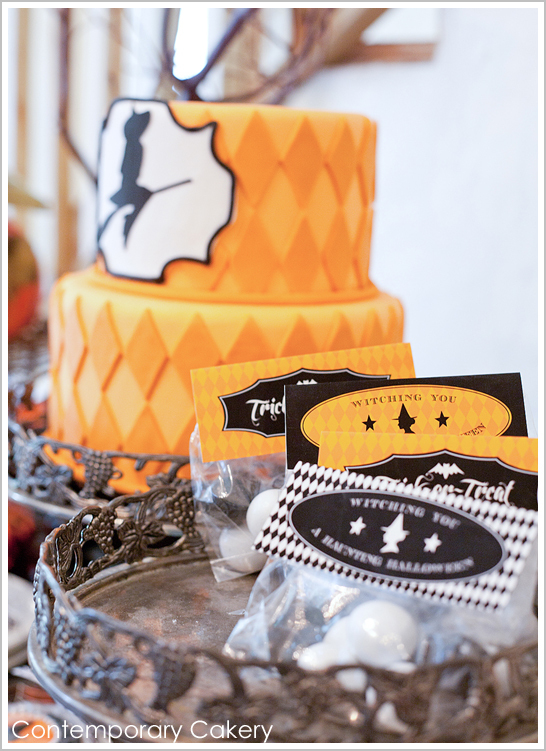 This enchanting display features one wickedly modern Halloween cake!! 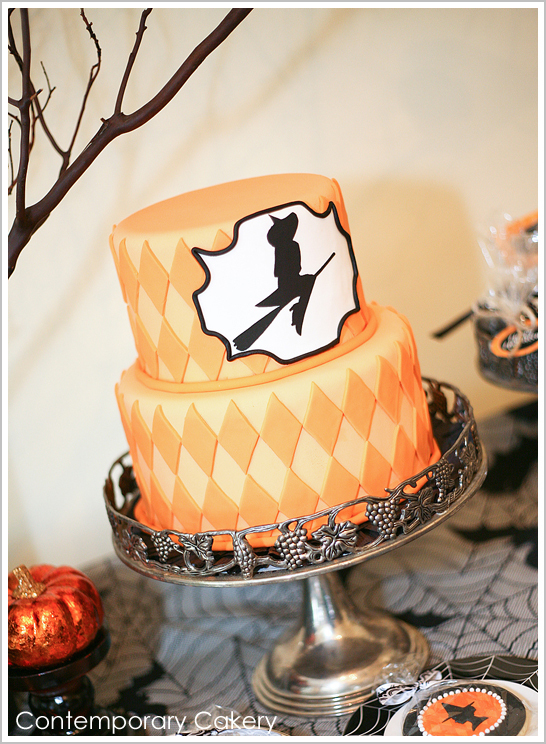 With an orange harlequin pattern and a sleek black and white witch silhouette, this cake is simply charming. The shadows dancing in the background, the witch on her broom flying through the night…. can’t you just hear her cackle floating in the air? Prepare yourself. This Bewitching Halloween Cake by Contemporary Cakery has me absolutely spellbound! 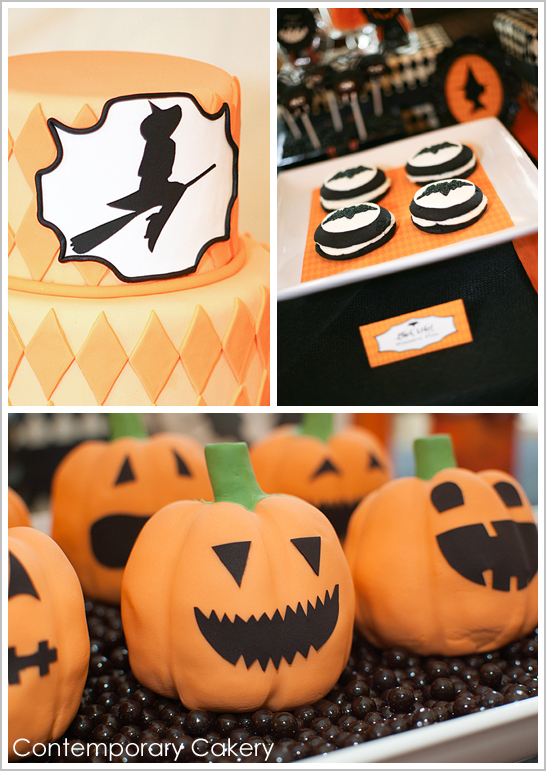 “For our Bewitching Party, I was really fortunate to gain the services of Andrea from Contemporary Cakery in Jacksonvile, Florida. It is always amazing to hand over a set of graphics for ‘inspiration’ and see what other talented artists create from them. Andrea dreamed up all sorts of witchy desserts for our table! I’m captivated by this whole display, but especially the cake! It’s preppy, modern and wicked fun all at the same time! And for some reason, it has me singing… Ooh-hoo, Witchy Woman… she how high she flies! Ooh-hoo, Witchy Woman… she’s got the moon in her eyes! A special thanks to Paula of Frog Prince Paperie for sharing this Bewitching Halloween Dessert Table with us and to Contemporary Cakery for the amazing Halloween cake inspiration! This Halloween display is just amazing, but with no surprise. Andrea (Contemporary Cakery) made an unbelievable Spiderman cake for my sons 3rd birthday party. It was faboulous from the outside in. It was imaginative and detailed yet the cake was still moist and delicious! Not to even mention affordable! If you live in the Jacksonville area you MUST give Andrea a call for your next occasion, or for no occasion at all. I mean the girl is amazing!!! Such a beautiful cake!! I love the whole thing! you and you guests will enjoy even the last bite of that cake. We all do!! Love the witch silhouette against the orange! Such a nice contrast. Wow! So striking! Love it! This cake is so cute, I can’t stand it! And I love the little pumpkins. The little woopie pies with the bats are such a smart idea ad the display is amazingly cute!! I’m a little obsessed with this whole table!!!!! !